Vatican City, May 25, 2008 / 11:03 am (CNA).- Speaking to pilgrims about the feast of Corpus Christi, Pope Benedict XVI said "the Eucharist reveals the true beauty of Christianity" and is "the school of charity and solidarity that should make us more attentive to the many people who struggle to procure their daily bread." The Holy Father elaborated on this feast of the Eucharist, calling it "a wonderful gift of Christ, who at the Last Supper wanted to leave us with this memorial of Easter, the sacrament of his Body and Blood, a token of his immense love for us." The Eucharist, he said, is "the school of charity and solidarity. He who eats of the bread of Christ cannot remain indifferent before those, who also in our day, are deprived of their daily bread." Addressing the problem of rising food costs and poor distribution, he said, "Many parents can hardly procure enough food for themselves and their children. It is a growing problem that the international community is making great efforts to resolve. The Church not only prays ‘give us this day our daily bread,’ but the example of the Lord who in so many ways ‘multiplies five loaves and two fish’ with countless initiatives to promote humanity and sharing, so that no one is lacking in what is necessary to live." The Holy Father added that Christians are called to be attentive in concrete ways to the many who go without food. "Dear brothers and sisters, let this feast of Corpus Domini be an occasion to grow in the in this concrete attention to our brothers, especially the poor." "We obtain this grace from the Virgin Mary, from whom the Son of God took flesh and blood, as we repeat in a celebrated Eucharistic hymn, set to music by the one of the greatest composers, Ave verum corpus natum de Maria Virgine… Mary, who brought forth from her womb Jesus, who was the ‘tabernacle’ of living, imparts to us her own faith in the holy mystery of the Body and Blood of her divine Son, since he is truly the center of our lives." At the end of his address, the Pope invited all those present to join him in Rosary in St. Peters Square next Saturday evening. Hello all. Yesterday's Inquirer had the article "Judging Israel, Judging CFC" by John Nery. It was basically his rejoinder to the attacks of his fellow columnist Conrado de Quiros against me. But wait, the article looked very familiar. Of course! It was the very same article that appeared in the May 13 issue of the Inquirer. But wait! Something quite strange. The whole page, a part of the May 24 issue of the Inquirer, was dated May 13! The Inquirer had printed page A15 of May 13 in the May 24 issue! Now that is unprecedented. I do not think something like that has ever happened before. Perhaps it could be understandable if page A15 was from yesterday's issue, since perhaps one page out of the whole newspaper was inadvertently not replaced by the printers. Or, a little bit more farfetched but still possible, it could be understandable if page A15 had appeared on the same day of the week, in this case Sunday, since perhaps someone had pulled out the wrong Sunday's page. But May 13 was a Tuesday. What happened was totally unprecedented. Why did it happen? Well, I was talking with Rene & Lorna Evidente last night at a CLS and Rene told me about the article, which he saw for the first time (I myself last night had not yet read yesterday's newspaper). I was even asking if it was a second response of Nery to de Quiros, but it became clear that it was the same article. So the Lord allowed it to be reprinted, so that those who did not read it the first time would have the opportunity to see it this time. But more importantly, God was just showing that He can and does act miraculously! Beyond our wildest imaginings. God continues to show that He can confound the wisdom of man. That He can cause to happen what probably has not happened in the whole experience of newspaper publishers. That He can surprise us with joy. That He can fight for us in His own way. But there is more. Hold on to your seats! May 13 is the Feast of Our Lady of Fatima. Mama Mary appeared to Lucia, Francesco and Jacinta on May 13, 1917, as the woman clothed with the sun. In subsequent appearances, she told the children they will have much to suffer. She told them to say the rosary every day to earn peace for the world. She showed them a vision of hell. She said that to save people from hell, God wanted to establish throughout the world a devotion to her Immaculate Heart. Fatima is the key Marian apparition of the 20th century. This was the time of atheistic Communism, personified by Russia. Pope Pius XI said: "Today we see something that world history has never seen before: The waving of the flag of Satan in the battle against God and religion, ..."
On May 13, 1946, Pope Pius XII crowned the image of Our Lady of Fatima and proclaimed her "Queen of the World." On May 13, 1967, Pope Paul VI went to Fatima and called for renewed consecration to the Immaculate Heart. On May 13, 1981 (the year CFC was born), Pope John Paul II was seriously wounded by an assassin's bullets. He was saved from death when he turned to look at a young girl in the crowd wearing a picture of the Virgin of Fatima. On May 13, 1982, Pope John Paul II visited Fatima and thanked the Blessed Mother for saving his life. On May 13, 1990, Fr Gobbi gave a message that the third secret of Fatima dealt with apostasy and chastisement. In 1984, Pope John Paul II consecrated the world and therefore Russia to the Immaculate Heart of Mary. On May 13, 1990, Bishop Amaral of Portugal announced that the collegial consecration of Russia by the pope to the Immaculate Heart of Mary, in union with the bishops of the world, had been accomplished as requested by Our Lady. However, also on May 13, 1990, Fr Gobbi said that Russia had not been consecrated to Mary according to her request, and so had not received the grace of conversion. On May 13, 1991, Pope John Paul II went to Fatima and thanked Our Lady of Fatima for sparing his life in 1981, and thanked her for the fruits of the collegial consecration of 1984. In 1991 the Soviet Union fell and broke up into separate republics. Communism had collapsed. But today the threats to humanity continue. Satan continues to wreak havoc on nations and even in the Church. Satan has brought a rejection of God and His law of love, spreading division and hatred, immorality and wickedness and legitimizing divorce, abortion, obscenity, homosexuality and recourse to any and all means to obstruct life. Mary has revealed that the triumph of her Immaculate Heart will only come with the defeat of Freemasonry, of materialism, of practical atheism. God raised CFC as His army in June of 1981, partly as a response to Satan's attacks on the Church, targeting the very head of Catholicism (May 1981 assassination attempt against the pope). God manifested His great power through CFC in its first two decades. But Satan was able to infiltrate the body and eventually succeeded in breaking up CFC, thus threatening to stop its work for family life and evangelization, the very aspects crucial to the life of the world. But now God restores His remnant. We are back to our original charism, to our authentic calling. We are back on track. And CFC-FFL has been consecrated to our Mama Mary. We are under her maternal protection. She guides us. She desires that her Son Jesus be known by all and accepted as Savior and Lord. And CFC-FFL is her army that carries the banner of her Son Jesus Christ. But know that, in a revelation by Mary to Sister Agnes Sasagawa in Akita, Japan, that the demon will be especially implacable against souls consecrated to God. The moment of great trial for the Church has come. Who can understand God's ways. God has allowed this unprecedented human glitch in a newspaper article to remind us of what we are about in our life and mission. The enemy promotes New Age and Masonry, uses lies and half-truths and widespread disinformation, spreads division and hatred, causes people not to reject anti-life scourges such as contraceptives in the name of helping the poor, causes people to reject God's law of love even as they proclaim love to be their theme, and removes Christ from the center of people's lives and work. We are into intense spiritual warfare! Satan has waged open war against God and religion. Satan is out to destroy the Roman Catholic Church. We who stand up in defense of the Church and who are God's soldiers are deeply involved in this spiritual warfare. Being objects of the enemy's fury, we will have much to suffer still. But as we suffer for righteousness' sake, we can truly rejoice. Let us continue to wield the weapons of truth clothed with righteousness (Eph 6:14). Let us continue and even intensify our evangelization, proclaiming the gospel of peace. And let us "pray at every opportunity in the Spirit" (Eph 6:18). Let us seek the maternal embrace and protection of our Lady, Mary, Mediatrix of All Grace. We are on the right track, and God has led us there. As we remain steadfast in restoration, God will vindicate us, protect us, and bless us. Expect more of such blessed surprises in the days to come. New ecclesial movements such as CFC have been recognized by the Church as God's blessings for the work of the third millennium. This is why CFC was officially recognized by the Vatican, the only one for the whole of Asia. CFC works as an integral part of the one Church, according to her life and mission. While ecclesial movements are given wide autonomy, in order not to stifle the Spirit and its particular charism, the pastoral solicitude of the hierarchy is still very important. The bishops provide guidance, wisdom and protection. This is especially the case when there is conflict within the movement, as happens many times, and especially as such conflicts involve the very top leaders. Where do they then turn to? They should turn to the bishops. CFC ultimately split because the top leadership of CFC, the Int'l Council (IC), did not submit to the discernment of ecclesiatical authority. The bishops (Archbp Lagdameo, Bp Reyes, Bp Villegas) only intervened in order to correct the veering away, and did it out of great love for CFC. But the IC refused the strong recommendations of the 3 bishops, reneged on the win-win agreement approved by the bishops, showed continuing disrespect to their Spiritual Director by not following his directives (such as giving all CFC members his letters addressed to all) and by distorting his actions (thus causing him to formally correct them at least 3 times). All the disrespectful actions of the IC led to the resignation of Bp Reyes as their Spiritual Director. Such is an unprecedented move! In resigning, Bp Reyes said that he would always side with what was right and true. He had found that CFC under the IC had veered away and had been disobedient to the bishops, and were no longer following his wise advise and directions to them. With the resignation of their very own Spiritual Director, the non-submission to ecclesial authority by CFC under the IC was complete. CFC had lost the guidance, wisdom, discernment, and moral grounding that could only come from the bishops. Having rejected the bishops, CFC-GK, through its apologists, even now attacks them, attacking even Cardinal Rylko of the Vatican. Now they also no longer have their founder, in whom the charism of the ecclesial movement is vested. Having lost the guidance and protection of the pastors and shepherds of the Church, CFC under the IC may simply have lost what is good, true and beautiful. VATICAN CITY, 17 MAY 2008 (VIS) - The Holy Father today received in audience a group of bishops, participants in a seminar promoted by the Pontifical Council for the Laity to reflect on the question of pastoral solicitude towards ecclesial movements and new communities. The seminar was held from 15 to 17 May at Rocca di Papa near Rome. "Ecclesial movements and new communities", said the Pope, "are one of the most important novelties the Holy Spirit has generated in the Church in order to put Vatican Council II into effect. ... Paul VI and John Paul II were able to welcome and discern, to encourage and promote, the unexpected emergence of the new lay groups which, in various and surprising ways, restored vitality, faith and hope to the entire Church". Although "no small amount of prejudice, resistance and tension has been overcome", said the Holy Father, "there remains the important task of promoting more mature communion among the components of the Church, so that all charisms, while respecting the specific nature of each, may fully and freely contribute to constructing the one Body of Christ". 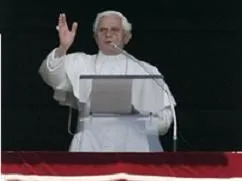 Pope Benedict then turned to consider the theme of the seminar - "I ask you to reach out to the movements with great love" - an exhortation he himself had addressed to a group of German bishops on their "ad limina" visit in 2006. "Reaching our with great love to movements and new communities", he said, "impels us to an adequate knowledge of their situation, avoiding superficial impressions and reductive judgements". This helps us to understand that such movements "are not a problem, ... they are a gift from the Lord, a precious resource to enrich the entire Christian community with their charisms". "Difficulties and misunderstandings on particular points do not justify [an attitude] of closure", said the Pope. And he told the prelates that they must "closely accompany" the movements and new communities "with paternal solicitude" so as to put to good use "the many gifts they bear, gifts we have learned to know and appreciate: their missionary drive, their effective courses of Christian formation, their witness of faithfulness and obedience to the Church, their sensitivity to the needs of the poor, and their wealth of vocations. "The authenticity of the new charisms is guaranteed by their willingness to submit to the discernment of ecclesiastical authority", the Holy Father added. In this context he indicated that bishops "must examine and test the charisms in order to recognise and evaluate that which is good, true and beautiful, that which contributes to increasing the sanctity of individuals and of the community. And when it is necessary to intervene in order to correct", he concluded, "such interventions must also be expressions of 'great love'". WHERE REALLY "IS THE RUB?" The CFC-FFL owes it again to the likes of Messrs. Esposo and de Quiros that GK and the CFC Council are now shaking in their boots because these self-proclaimed apologists of Tony Meloto are doing them more damage and harm than good with the almost daily tirades of "chair wreckers" and pony-tailed rub-a-dub-dubs further alienating them from the Catholic Church while their statutes proudly proclaim they are sworn to defend and protect it. But where "is the rub" coming from this time? It's a vitriolic reaction to a CFC-FFL statement exhorting its members to be vigilant in terms of how CFC and GK continue to be manipulated by beliefs and statements laced with New Age pronouncements long decried by the Catholic Church for their schisms. But why should there be a "rub" if Frank Padilla was merely warning the members to be wary of the danger these beliefs present to Catholic teachings and doctrines? Was Padilla merely stating a fact or was it something he conjured out of thin air? Aren't all Catholics be better forewarned of the subliminal warfare going on? Is Boy Montelibano in truth and in fact Tony Meloto's righthand man, dutifully following his "creation" with snapshots while the former talks about our duty to build a nation in the midst of problems and complaints coming from GK donors who continue to ask on how funds disbursed match squarely with the exact number of houses promised? On GK former sites once bruited to be of 1st world class and showcases now abandoned by its occupants ? On how GK's upscaling has created horrendous strain on its absorptive capabilities? Where "lies the rub?" It is not news at all that a year before Frank Padilla and Tony Meloto resigned as Council members, Tony Meloto addressed the Elders' Assembly of the CFC gathered at St. Paul's Pasig and managed to step on sensitivities when he said, in so many words, "kung hindi kayo naiiinvolve sa GK activities, dapat ay maghanap na kayo ng ibang community na malilipatan." That was an ominous rub that signalled Tony Meloto's preparedness to incur the ire of CFC leaders because he knew he had an array of partners to back up his GK projects. In another assembly down under in Australia, Tony Meloto was setting the stage for the eventual divide when he told a CFC audience that "CFC is dead and GK is the new evangelization." This statement revealed in no uncertain terms where his priorities lie and where he and his spinmasters would like to take GK into, using the warm bodies of the worldwide CFC network to the clarion call of a not so distant 2010 election. The "rub" here goes deeper than a mere massage but cuts deep into the very core and skin of the body politic. Of course, the CFC Global blogger who proclaimed "to hell with the Vatican; long live GK!" ( a violent frothing to Cardinal Rylko's admonition of CFC/GK) shows the lengths to which Meloto's horde of followers would go into to push what is obviously becoming an agenda that would catapult the bruited "founder of GK" into an arena beyond the social. Proofs of this direction is how Meloto figured in the latest presidentiable polls and how a triad of columnists continuously harangue their readers with paeans of praise to this God's greatest gift to mankind. Where "lies the rub?" The rub lies in the fact that the Catholic Church, personified by no less than the Vatican, has deemed it fit to censure CFC and GK from overstressing the social mission to the detriment of evangelization. 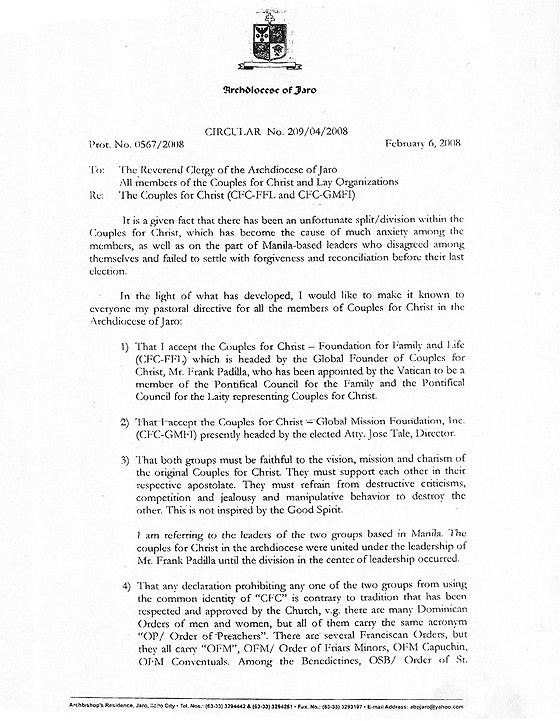 The rub lies in GK veering away from the life and mission of CFC by overprotecting its benefactors and donors to the extent that CFC members were told to avoid "unfurling its Christian banner in public" (quote from Mr.Esposo in a past column) while Habitat for Humanity proudly proclaims that it is a Christian organization. The final rub on CFC is the resignation of its Spiritual Director, Bishop Gabby Reyes, concurrently Chairman of the Episcopal Commission of the Laity of the Catholic Bishops Conference of the Philippines (CBCP) who threw in the towel out of exasperation caused by the recidivist misbehaviour of his former wards towards the Church. Indeed, the Vatican has spoken and instead of taking on the likes of Messrs. de Quiros and Esposo, CFC-FFL is better advised resting its case. The other side may have just shot its own foot. Wisdom of Bishop Tobias from the Diocese of Novaliches in response to the letter of CFCGMFI IC asking for the exclusive use of the name "Couples For Christ". to put this opinion in the open, as this has been the basis of our policy on the CFC so far in our Diocese ...."
The detractors of the Church continue on without let-up, and are even intensifying in vitriol and hatred. The following is the response of Boy Montelibano to our brother Udo of Berlin, who wrote Boy asking him to stop his insulting writings. Brother Udo is a German national. How narrow-minded you are, Udo, for a citizen of a developed country that was once Christian but not so much anymore. No wonder you went FFL. You do share the same fundamentalism and bigotry that characterize a group without any vision but to attack others. How ignorant you are, too, to believe that we caused Reyes to resign. The bishop was told by the Council that he is not the spiritual adviser that CFC wants. And why should CFC want a spiritual adviser who has worked so hard to hurt and destroy it? And why should he not resign? CFC did not choose Reyes to be its spiritual adviser. Frank Padilla, until last year, never asked for advice from Reyes. Reyes just happened to be the head of LAIKO and gets to be adviser, by default, of Catholic charismatic/renewal groups unless they choose someone else. And Reyes is stepping down in a few months from that position and will anyway lose his being spiritual adviser by default. How stupid you must be, Udo, to believe Reyes would resign because of a few articles. He was not sensitive enough to stay away from a family quarrel and was partisan enough to cause a great pain to hundreds of thousands to please a few thousand. Why will he let go of a position that can allow him to have power over CFC unless he is already scheduled to lose it soon? There lies the real problem, Udo. People like you and those you follow think you are holier than others when you may be the farthest from it. It is not only the bishops and priests who sexually abused children in America that hurt a collective soul. It is also bishops like Reyes and bigots and fundamentalists like your leaders who have abused the hearts and souls of my brothers and sisters in CFC. If you can manage it, have a good life. P.S. By the way, Cardinal Rylko has proclaimed that you cannot use CFC anymore. Oh, I forgot, FFL can do what it wants without being disobedient. After all, you do not report to the Catholic Church, only to bigots and fundamentalists. How quickly a German forgets history. Once again Boy Montelibano degrades Bishop Reyes, whose only "sin" was to stand up for the truth and for what is right. Once again he tells all sorts of lies about Bishop Reyes, who through the crisis acted with utmost uprightness and fairness, even bending backwards for CFC-GK and the IC. Once again Boy Montelibano shows his disdain for the clergy. In his writings he has consistently emphasized their being sexual abusers and bigots and fundamentalists. Having consistently attacked the clergy, including the bishops, then even Cardinal Rylko of the Vatican, where will these detractors stop? Perhaps, in insulting Udo, he might even conveniently forget that our beloved pope is also a German. We call on the IC, whose members say they have control over GK, to correct Boy Montelibano. We call on Joe Tale and the others to defend the Church and the hierarchy from such constant verbal abuse. We call on them to protect the hearts and minds of their members, especially the youth, from the secular ideas of New Age. We call upon everyone to pray intently and incessantly for our beloved bishops and priests. And speak up in their defense whenever they are attacked. The detractors of the Church are still at it. "I have openly questioned or criticized the Church for being laggardly in the fight against poverty ..."
"After four hundred years, and after our country rising steadily to be rated as one of the poorest and one of the most corrupt, how can the powerful Catholic Church be exempted from accountability?" "The Church must understand that our poverty ..... is rooted in landlessness and the exploitation of those with POWER and INFLUENCE. The Church hierarchy, like all Catholics, must examine its conscience, repent for its sins, and move with determination to atone and do penance. The Church hierarchy has four hundred years to reflect on, as those four hundred years extend their consequences to the present times." "they should hang themselves and their bishop friends for good measure." "Meloto doesn't need the Church, the Church needs Meloto." "No one (Meloto) has done more to keep the faithful faithful, or at least willing to give their guardians another chance, amid the determined efforts of many of those guardians to turn Rock into Rubble." These detractors think that only Gawad Kalinga (GK) is the way to helping the poor, and if you are not all out for GK, then you are not living out your faith. They ignore the reality that the Catholic Church is the one institution that has done so much for the poor and continues to do so. And the Catholic Church does its work with the poor without fanfare and without any political agenda. But these detractors disdain the Church. In their view, the Church is the main cause of poverty in the country. And of course, they are the saviors. "Don't you think that Tony Meloto and the GK movers are indeed the genuine Christians ....?" (William Esposo, "Tony Meloto's Sanctification," April 27, 2008). The pastoral thrust of the Catholic Church in the Philippines is to build the Church of the Poor. These detractors would do well to find out what the Church does for the poor---quietly, without mass media, without marketing gimmicks, without sounding its own horn. And in helping the poor, the Church openly proclaims Christ who loves the poor, not pointing to mere man as the savior of the poor. Allow us to share this piece entitled "Be Proud That You Are a Catholic - from a prominent Jewish businessman." This is the situation in the US, where the Catholic Church has been attacked even more than in the Philippines. Why would the media carry on a vendetta on one of the most important institutions that we have today in the United States, namely the Catholic Church? Do you know - the Catholic Church educates 2.6 million students everyday at the cost to your Church of 10 billion dollars, and a savings on the other hand to the American taxpayer of 18 billion dollars. Your graduates go on to graduate studies at the rate of 92%, all at a cost to you. To the rest of the Americans it's free. The Catholic Church has 230 colleges and universities in the U.S. with an enrollment of 700,000 students. The Catholic Church has a non-profit hospital system of 637 hospitals, which account for hospital treatment of 1 out of every 5 people - not just Catholics - in the United States today. 17% of Protestant laywomen have been sexually harassed. Meanwhile, 1.7% of the Catholic clergy has been found guilty of pedophilia. 10% of the Protestant ministers have been found guilty of pedophilia. This is NOT a Catholic Problem. A study of American Catholic priests showed that most are happy in the priesthood and find it even better than they had expected, and that most, if given the choice, would choose to be priests again in face of all this obnoxious PR the Catholic Church has been receiving. "Stand by the roads, and look and ask for the ancient paths, where the good way is and walk in it, and find rest for your souls". Be proud to speak up for your faith with pride and reverence and learn what your Church does for the country, and all other religions. Be proud that you're a Catholic ! Reprinted excerpts with permission of the Buckeye Bulletin - courtesy of Brookside Council #3297, Cleveland Diocese, USA. We repeat what was said: "Be proud to speak up for your faith with pride and reverence and learn what your Church does for the country, ...." And to that we say, AMEN. Once again we are reminded of the raison d'etre of CFC's existence. God raised CFC as a new ecclesial movement to participate in the work of the new evangelization. We mobilized our members to become enthusiastic evangelizers. We proclaimed Christ and helped bring Christ into the lives of many individuals and families. We participated in renewing the face of the earth. But there was a veering away. A secularized gospel began to be proclaimed, focusing on the social apart from the spiritual. Christ lost his place at the center. Christ was no longer the star that guided the activities of some among us. But now we in CFC-FFL are restored to our original charism. We are back to what God originally called us to. CFC-FFL is back to being a new ecclesial movement that proclaims Christ and pursues the new evangelization. And this is the decisive challenge of today. It is not that we are more perfect Christians, as we are all sinners. But now that we are restored to doing God's work in accordance with His plan, then we can expect His anointing, as we are but instruments. Let us move on then, and proclaim Christ with a passion. VATICAN CITY, MAY 12, 2008 (Zenit.org).- New movements and ecclesial realities are part of God's answer to the Church's need for a new evangelization, says Cardinal Paul Cordes. The cardinal, who is president of the Pontifical Council Cor Unum, affirmed this Sunday when he took possession of his titular see, San Lorenzo in Piscibus, home of the San Lorenzo Center, which Pope John Paul II established 25 years ago as a center to welcome youth to Rome. When still a vice president of the Pontifical Council for Laity, Bishop Cordes was entrusted with founding the center. And now as a cardinal, the prelate said he considers himself committed in a particular way to the new evangelization. The red hat, he affirmed, is about more than just participating in conclaves for the election of a new pope. Cardinal Cordes said he chose Pentecost to take possession of the titular see because the feast is an invitation to the new evangelization, since "the fire, the flame of the Spirit of God wants to set others ablaze." But, "where are the missionaries?" the cardinal asked. And he answered that God already considered years ago that the Church would have a need for evangelization. "Since the middle of the last century, he has brought men and women in movements and new [ecclesial] realities to awaken in the Church enthusiasm for evangelization," the prelate contended. "He has given them the grace to speak in a fascinated and fascinating way about Jesus Christ, to enthuse people about the following of Christ, to find in Jesus of Nazareth -- just as he is proclaimed by the Church -- the center of their very existences and the fount of a plentiful life." "These groups are not new walls between consecrated and laypeople, between mission in the Church and mission in the world," Cardinal Cordes continued. "This is not about canceling the diversity of ministries and responsibilities: They seek to awaken in every state of life a love for Christ, our brother and Lord, since from him alone comes salvation and joy." "Despite aggressive secularization, which wants to bring all of us to the idolatry of the 'I,' they keep Christ as the star that guides their activities," he said. "It's not that they are 'more perfect' Christians. They are Christians like all of us. But they are special since God has prepared them better for the decisive challenge of today: the new evangelization." 1. There is nothing to suggest but only the truth with respect to the references made by Archbishop Lagdameo relative to the Vatican recognition and the representation made for the whole of CFC by no less than Frank Padilla. Otherwise, the recognition could have taken the route of just indicating Couples for Christ. Neither did it say that the recognition only inheres with the CFC Global Mission Foundation, Inc. because, as we have stated in the past, there are 159 other CFCs which were part of said recognition. 2. There is significance placed in the "persona" of this representation vested by no less than Church ecclesiology and the implications it presents, including the accountability of the person who undertook said representation. It is no less than Church authority itself that places the mantle of governance on the person cited in the recognition and this "charism" inheres in that particular individual for as long as he lives. We will come out with a series of articles on the meanings of the Founder and the Keeper of the Charism in a future series. 3. The history behind the split has been well documented and no less than the CBCP's Episcopal Commission of the Laity led by Bishop Gabriel Reyes, as well as Archbishop Angel Lagdameo and Bishop Socrates Villegas, exhorted the erstwhile CFC Elders' Assembly and the IC not to push thru with the elections at a time of crisis and disunity. Bishop Reyes even made a last ditch effort and appeal to the assembly to heed the CBCP advice, but to no avail. Thus, the reference to the words "elected Head" carries a lot of implications in the Lagdameo letter and should be viewed from the context that said elections were held not in communion with the Bishops' repeated exhortations. Further, in view of the fact that the CFC statutes bind the community under the authority of the Bishops, the act of defying the Bishops' strong recommendations could have constituted an act of gross disobedience to Church authority. These make the reference to the words " elected Head" subject to close scrutiny and why the distinctions between "elected Head" and "global Head" had to be made. 4. It goes without saying that the words "Elected Head" simply mean since the incumbent secured the position by virtue of an election, his stint is subject to term limits and is at best temporary in nature. Going by the Archbishop's letter and reference to the "persona" of the one who made the representation, per ecclesiology and backed by moral theologians and the Archbishops themselves infer that the position of the one who is given the mantle of governance and recognized as the Founder inheres in the person as long as he lives, or decides to pass on the charism to another individual or a group of individuals. More on this subject will be featured at a future article. 5. The point has to be stressed that the report of Bishop Reyes on the Aug. 28, 2007 meeting allowed, in no uncertain terms, the existence of 2 communities. He went to great length even indicating that the use of the CFC name does not pose a hindrance to this co-existence. This is not without basis because it finds reinforcement in the amplification of Bishop Lagdameo's letter about the existence of multiple sub-communities within a "generic" community such as the Dominicans, the Carmelites, the Benedictines, etc. Thus, it is with much regret that CFC-FFL finds itself locked in a legal battle with CFC Global because the latter has claimed that it carries the sole birthright to the use of the CFC name. It may also be worthwhile mentioning that there are 8 other corporations bearing the name Couples for Christ which were approved by the SEC, the Couples for Christ Cooperative, the Couples for Christ Botika, among others. By circumstance, CFC-FFL finds itself the only target of CFC Global in petitioning the SEC not to let us use the name. 6. We also have to restress the point here that our Christ is an all inclusive God who welcomes both "Gentile and Jew alike." 7. CFC-FFL, thru Frank Padilla, has consistently proposed a CFC with 2 branches consistent with past Church practice explained earlier but CFC/IC has repeatedly rejected this proposal . 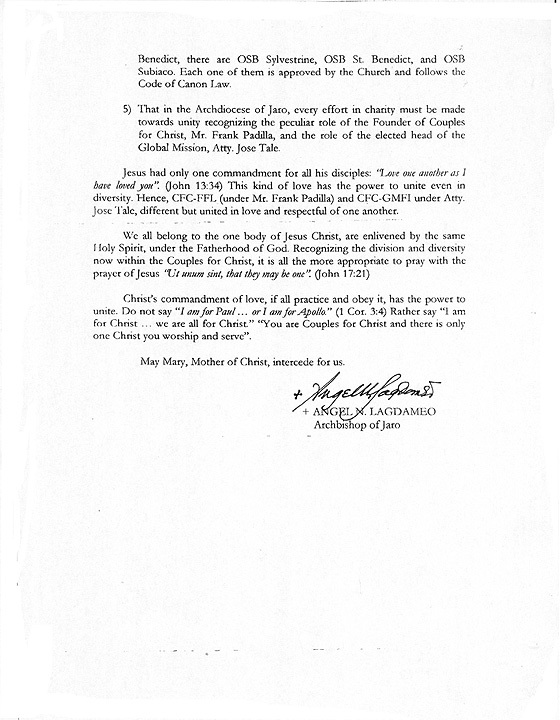 We exhort all CFC-FFL members to please read anew the declaration of Archbishop Lagdameo viewed from the exact context of what the statements contained therein mean in the light of the clarifications we have made above.